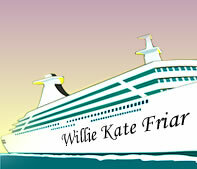 Willie Kate Friar has had a career as a diplomat, foreign correspondent , and also served as the Public Relations Director of the Panama Canal. She retired in April 1998 from the Panama Canal Commission where she had employed for the past 28 years. Ms. Friar was in charge of all the Panama Canal's public relations activities including the Canal's Visitor's Center, the printing facility, publications, television and movie productions, and meetings with the local and international press. She also served as the Canal's liaison with the cruise industry. On official assignments and on vacation as well as on cruises, she has visited more than a hundred and thirty countries including most of the countries of South America, Asia, Europe, the South Pacific, and the Middle East. A native of Georgia and a graduate of the University of Georgia College of Journalism and Mass Communication, she has lived overseas more than half her life including three years in Denmark and three in Germany where she worked as a correspondent for "Stars and Stripes" and as a free lance journalist and photographer. 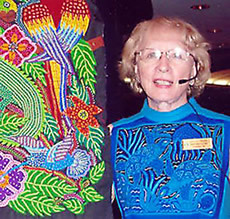 Following her retirement, she has written four books, "The Panama Canal-Questions and Answers," "What is a Mola-the Kuna of Panama and Their Fabulous Molas," "Blubba Transits the Panama Canal-The Tale of a Whale and a Whale of a Tale" (a book for children that explains a Canal transit) and "The People I met and The Things I learned While Cruising The World." Just click on the link for each book for more information. While employed by the Canal, and lecturing on cruise ships for the past eleven years, Ms Friar has made more than 170 transits of the waterway. She has recently finished her 99th cruise as a lecturer which included two world cruises. She lives in Panama City, Panama in a high-rise building with a view of the Pacific Ocean and Miraflores Locks of the Panama Canal. She has two sons, Robert, who lives in Boulder, Colorado with his wife Karla and three small sons, and William, the author of three books on Panama, who now lives in London with his wife, Karen. She lectures on 50 destinations including the: Panama Canal, Republic of Panama, The Kuna of Panama and their molas, The Embera and Wounaan of Panama, Ecuador, Peru, Chile, Argentina, Brazil, Uruguay, Russia, Denmark, Vietnam, Cambodia, Berlin, Scandinavia, Easter Island, Pitcairn Island, The Huichol of Mexico and other Mexico subjects.